The traditional sack barrow is a safe and effective way for an individual to move a heavy load. The body of this sack barrow is manufactured from high strength tubular steel and has a flat steel toe for easy location under the load to be moved. Hard wearing durable solid rubber tires with smooth running bearings ensure the barrow is as easy to manoeuvre when loaded as it is when unloaded. Rubber grips on the handles allow you to get a good grip. For a full range of material handling equipment please refer to our catalogue. Tubular steel with double framed sides for increased rigidity. Looped handles provide knuckle protection and positive grip in various positions. Curved crossbar - suitable for carrying cylindrical items. Fitted with 255mm long foot iron which has upturned back edge. 3 star wheeling with 150mm diameter rubber tired wheels for regular contact with stairs and curbs. Height x width - 1275mm x 620mm. Capacity 200kg. 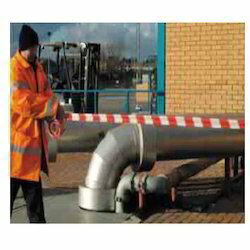 A flexible magnetic strip which adheres to any steel surface. Easily cut to size with a gloss vinyl surface which can be written on. For use with dry-wipe pens and solvent cleaner for wiping. 10m white rolls. Grease impregnated petrolatum tape. Self-adhesive and waterproof. British Gas approved. Requires minimal preparation. Flexible. Protects water and gas pipes, cables, mechanical joints, valves, metal surfaces and tensioning bars against corrosion. Effective for long term sealing & protection. Works above and below ground and under under water. Conforms to British Gas Standard BG/PS/CW2. The Tuff Safe earplug dispenser is supplied with 1,000 TuffSafe cordless earplugs (Refill order code: TFF-958-9020K). The dispenser is designed for durability and ease of use in the workplace; earplugs are dispensed singly simply by twisting the nozzle, the clear container allows the contents to be seen at all times helping to ensure, you do not unexpectedly run out of earplugs. The dispensers can either be fixed to a wall or stood on a workbench; anywhere you require them to be close at hand. Cordless type, disposable for comfortable hearing protection without impairing normal communication. Product conforms to EN352-2: 2002. Nominal size: smallest: 6, largest: 12. For the full range of Tuff Safe PPE equipment and work wear please refer to our catalogue. 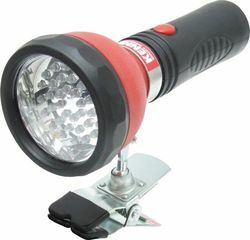 Kennedy?s ILR336 inspection lamp has 36 LEDs that deliver a brilliant white light to illuminate the area you are working on or inspecting. 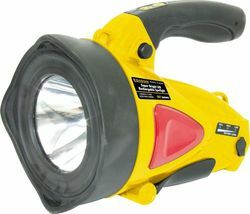 Ideal for use in engine bays and other low light work areas. Li-ion battery lasts up to 5 hours when fully charged. Ball-jointed swivel clamp gives maximum positioning versatility. Convenient grip mounted ON/OFF switch. Oil, petrol and UV resistant. Rubber handle. Supplied with mains charger. Led intensity at 50cm: 1200lux. Charger input: 230V - 50Hz. Charger output: 5V DC 600mAH. Net weight (inspection lamp only): 655g. Six super bright white LEDs. 100,000 hour LED life. Battery life up to 50 hours (continuous). Precision machined high-strength aluminum alloy case. All joints sealed with 'O' rings. Engineered and superbly balanced to give many years of service. 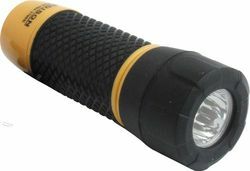 6 LED stretch torch that can be used as either a torch or a lantern. Push the housing together for a focused beam of light, or stretch the torch to illuminate a wider area. Comes complete with a cord wrist strap. Ultra bright energy-saving LEDs give a typical battery life of approximately 24 hours. Requires 4x AAA batteries (not included). 2.5 Million candle power super bright quartz halogen spotlight/lantern. Weatherproof. Two position handle, to ensure comfortable and ergonomic access. Swivel stand/handle. 6V 4Ah sealed lead acid battery. Supplied with AC/DC mains charger and 12V DC car plug adapter for portable charging. Battery operation time (20 hours full charge): 20 minutes. 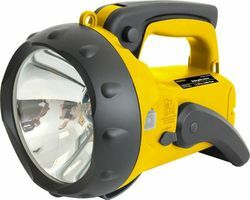 Super bright LED rechargeable spotlight up to 247 lumens. Weatherproof. High and standard brightness mode. SOS distress signal. Emergency light/blinking light. Two position handle, to ensure comfortable and ergonomic access. Swivel stand. Battery level indicator. 6V 4Ah sealed lead acid battery. Supplied with AC/DC mains charger and 12V DC car plug adaptor for portable charging. 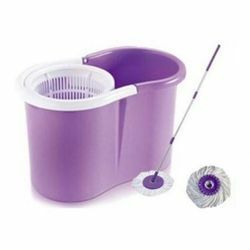 This new type of bucket mop is a revolution in cleaning technology. Equipped with a unique double function bucket which can perform drying and rinsing action very efficiently. These mops are equipped with special microfiber cleaning threads which can easily pick up dirt without leaving lint. Its fully rotating head can reach any corners and inside parts of your rooms. It is very light weight and long lasting. Made from Superior Quality Plastic. Ideal for use by any age group of your house or Industry. Comes with one extra Mop Refill. One Mop Brush to clean tough grease, grim and dirt. One Chenille Mop to clean windows and walls. Can be used on Wooden, Hardwood, Marbonite, Glass, Italian Marble, Vitrified and Granite flooring. We recommend that you can visit our store and check the product by using first and only then place an order. Specially designed hand-operated spin system uses centrifugal force to squeeze out all the excess water so that your floors dry faster and without drips or streaks. The super-large, 360 degree rotating mop head allows you to cover more surface area and reach those difficult corners with ease. Safe on all types of hard flooring, it soaks up big spills and shifts stubborn scuff marks in seconds. When used dry, it attracts dust and dirt particles like a magnet, maneuvering effortlessly around and under furniture. Mop head replacement is simple and uses a foot activated system, so you will never need to handle a dirty mop head again. Anodised aluminum handle and head, which is water resistant and shockproof. Heavy duty magnet - tested up to 2kg. Body can be twisted in any direction to illuminate areas normally inaccessible to conventional light. End handle push button on/off. Spare bulb supplied. 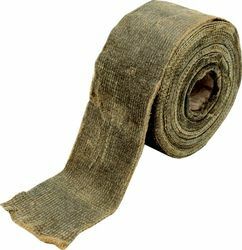 Barrier Tape - Non-Adhesive Non-adhesive hazard tape. Red and white or yellow and black diagonal stripe. (30 micron). With dispenser box. Looking for Maintenance and personal protection ?